The Michigan Department of Corrections (MDOC) has adopted a new policy for the care of transgender prisoners after a transgender woman incarcerated in a Michigan prison campaigned, with the help of the Southern Poverty Law Center (SPLC) and the American Civil Liberties Union of Michigan (ACLU of Michigan), to receive the hormone therapy she was denied. The policy, which takes effect today, came after Jami Naturalite wrote to the SPLC last year seeking information related to the SPLC case, Diamond v. Owens, which successfully challenged a similar, unconstitutional policy in Georgia. The SPLC and the ACLU of Michigan contacted prison system officials on her behalf in October, sparking a collaboration that resulted in the new policy that protects the Constitutional rights of transgender prisoners. 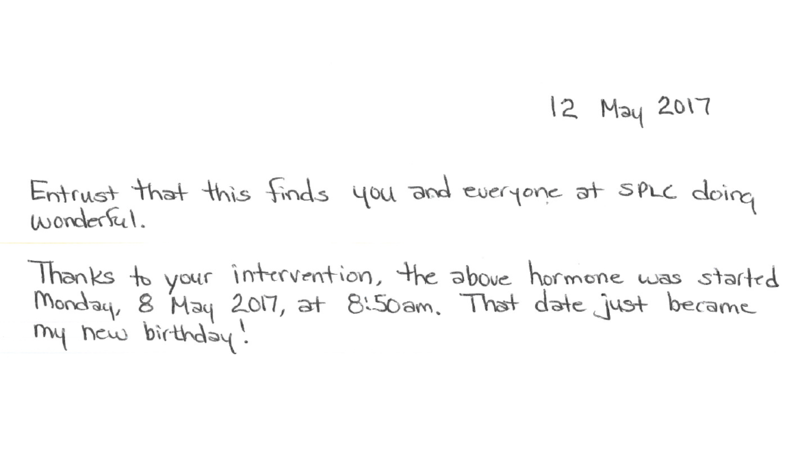 Letter from Jami Naturalite upon beginning hormone therapy. Denial of medically necessary, transition-related care for transgender prisoners amounts to “cruel and unusual punishment” under the Eighth Amendment. Without such care, transgender people may experience gender dysphoria – the distress associated with the conflict between one’s experienced or expressed gender and one’s assigned gender. It puts them at risk of anxiety, depression and suicide. Hormone therapy and gender-affirming surgery are medically necessary for many transgender people experiencing gender dysphoria. Before the MDOC’s new policy was implemented, however, hormone therapy was generally limited to individuals who were already prescribed hormones and were scheduled for surgery before they were incarcerated. The policy effectively froze the patient’s care without regard to medical need, which Naturalite experienced. Gender-affirming surgeries were also prohibited except in “extraordinary circumstances” determined by the chief medical officer and the MDOC director. Under the new policy, transgender prisoners will receive hormone therapy when the newly formed Gender Dysphoria Collaborative Review Committee finds it medically necessary. It also has the authority to consider gender-affirming surgeries on a case-by-case basis. Transgender prisoners with gender dysphoria are also entitled to at least two reassessments each year by a medical provider, in consultation with the review committee. The new policy also requires staff to act professionally and respectfully when searching or communicating with transgender and gender nonconforming prisoners. Treatment plans for prisoners must also consider housing placement, access to toilet and shower facilities with relative privacy, and what clothing and prison store items – such as undergarments and grooming aids – should be available. Although the policy took effect only today, the committee has already reviewed Naturalite’s case and recommended hormone therapy, which she began last month.